All trails on United States Air Force Academy property are open every day between 5 a.m. and sundown. Be prepared for a variety of weather conditions, as storms can move in very quickly from the mountains. This trail is open year round to hikers. It is a 13-mile loop that provides views of the natural and man-made beauty of the Academy. The trail crosses the road at several spots, providing options to make the hike shorter. There are trail signs that explain the plants, geology and natural phenomena in the immediate area. For scouts who complete the entire trail, a patch is available from a local troop. This major regional trail follows the length of the Academy along highway I-25 from Monument to Colorado Springs. The trail is more than 40 miles long, but be aware that portions of this trail that cross the Academy grounds are subject to closure for security reasons. The Stanley Canyon trail is approximately 2 miles long and takes hikers from a parking lot near the Academy Hospital through Stanley Canyon to the Stanley Canyon Reservoir. This trail offers a panoramic view of Colorado Springs and the surrounding area. Portions of the trail are very steep with loose footing so hiking staffs or similar walking aids are strongly recommended. From the Stanley Canyon Reservoir, the Farish Hiking Trail takes you further into the mountains and into Pike National Forest. This 5.5-mile trail is partially on dirt roads and abandoned jeep trails. This trail provides relatively easy walking to the Farish Memorial and Academy recreational facility. The Academy Services Squadron controls this facility. Be prepared for a variety of conditions along the trail. Storms move in very quickly and temperatures during the summer can fall below freezing. 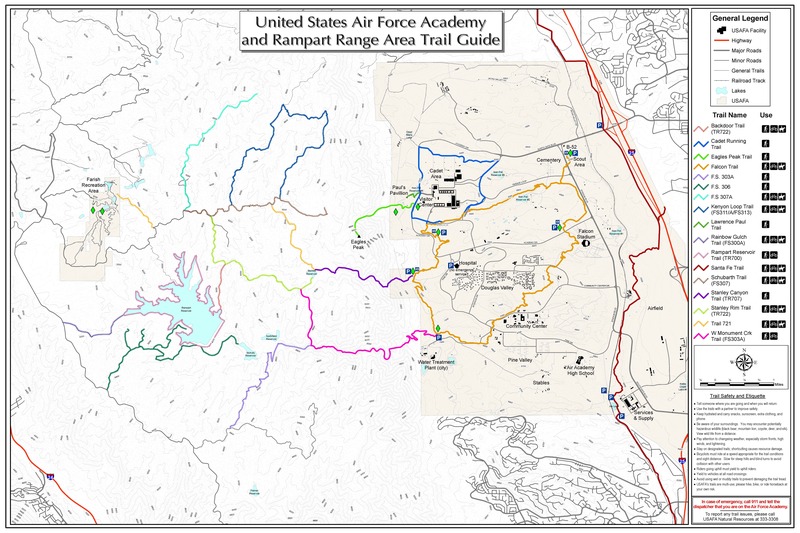 Visit usafasupport.com for more information regarding trail access, hours, etc. A map of the trails is also available at the Visitor Center.